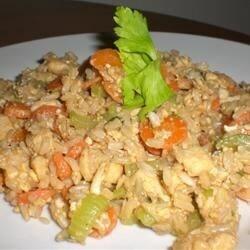 "Chicken is quickly stir-fried with carrot and onion before mixing into fried rice for a quick and tasty meal." Heat oil in hot wok or large skillet over high heat. Add chicken, green onions and carrot. Stir-fry 3 minutes, or until chicken is thoroughly cooked. Add egg; cook, stirring gently, until firm. Stir in rice and cook until heated through. Add roasted garlic teriyaki sauce; remove pan from heat. Stir mixture until well mixed. Serve immediately. I followed the recipe completely except we couldn't find the kikomans sauce so I used KC Masterpiece Honey Teriyaki marinade. It was great! I have filed this recipe in our family favorites. I marinaded my chicken overnight. I also went with a 1/3 of a cup marinade. It was great. This was alright. Nothing too exciting. We made more chicken than it called for and therefore added more sauce. We also added another egg. I used jasmine rice which worked fine. very good. i think i could of eaten the whole thing on my own and not shared any with the rest of the family. my wife is planning to use shrimp next time. Very good but definately should double the sauce amount for a better taste.